« Does training induce long term muscle damage? What is the best way to train for a marathon? If you are not looking beyond the present season, you can choose between several good answers, according to personal circumstances and inclination. A number of quite diverse approaches, ranging from a Lydiard-style program starting with high volume base-building followed by race-specific training, to the more intense Furman ‘train less; run faster’ program combined with cross-training, offer a the prospect of a good marathon, provided the training is consistent yet flexible enough to allow a good balance between hard work and recovery. The question of how best to train in a way that leads to year on year improvement is less easily answered. The recent study in which Stoggl and Sperlich randomly allocated previously well-trained athletes to one of four different training regimes: high volume, high intensity, threshold and polarised found that the polarised schedule (characterised by a large amount of easy running ad a small amount of high intensity) produced the greatest gains, adding to the growing body of evidence that a polarised schedule offers the best prospect of improvement for athletes who have reached a plateau of performance. The presentation by Stephen Seiler delivered in Paris in 2013, summarises the evidence that many elite endurance athletes have achieved their success on the basis of polarised training schedules. But for me personally and for other runners on the threshold of the transition from middle-age into old age, there is an even more challenging question: how can one delay the sharp decline that typically begins in the late sixties or early seventies. As discussed in my recent post describing the training of seven elite masters marathoners, for Derek Turnbull that steep decline occurred in his late sixties; Ed Whitlock managed to defer the decline until almost 80. In my youth I competed in track athletics at club level and discovered almost by accident that I had some talent for marathon running. However, I was more interested in hill walking and mountaineering and usually headed for the hills and mountains in the time left over after career and family activities. I took up running again in middle age. For the past seven years, I have trained regularly averaging around 4 hours per week running and in addition, spent a couple of hours per week on the elliptical cross trainer. The thought of once again attempting to run a good marathon has been lurking in the recesses of my mind for much of that time. But on account of a job that often demands long hours at work, I was content to defer my marathon plans for the time being. I ran a half-marathon in September in several of the past 7 years. My times were very slow compared to the marathon times of my youth, but overall, the situation appeared fairly stable. Two years ago, at age 66 my time of 101: 50 was identical to my time at age 62. There was no sign at that stage of a precipitous drop. Indeed, because these times were so slow relative to my former marathon times, I was optimistic that once I could finds a little more time for training, there was still scope for improvement before the decline into old age. Last year I did increase the volume of my training, aiming for a half-marathon time of less than 100 minutes, but was a little dismayed to find that as September approached, I was less fit than in previous years, despite the increased training. In the event I struggled to achieve a time of 107:49 minutes. Had the sharp decline into old-age already begun? If I am ever to run a good marathon again, it appears that I cannot afford to wait, irrespective of my continuing fairly demanding working hours. Figure1: the decline with age. 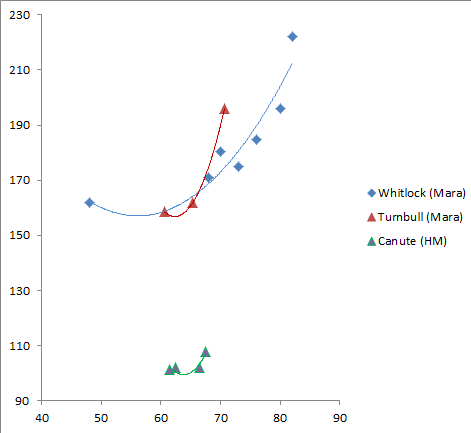 Whitlock’s marathon time increased sharply as he approached 80; Turnbull suffered a steep decline in his late 60’s. My half marathon times hint at an increasing rate of decline in my late 60’s. Can I arrest this? What could be described as a good marathon? In my mind, the thing that makes the marathon special is the fact that it is the longest distance that is raced on the brink of lactate threshold. The major challenge is developing the endurance to maintain that pace for 26.2 miles. Therefore, whatever limitation on speed that age might impose, I would consider I had run a good marathon if I could maintain a pace just below lactate threshold for the full distance. Although time itself is of lesser importance, I would nonetheless hope to achieve a time demonstrating that I have not yet succumbed to the steep descent into old age. My half-marathon time of 101:50 at age 66 corresponds to a WAVA score of 76. If last year’s performance was a mere hiccough rather than the beginning of the steep descent, a WAVA score of 75% might be therefore be a reasonable marathon goal. At age 70, this would correspond to a marathon time of 3:45. Compared with the times of my younger days, it should be an easy target, but at present appears quite daunting. Nonetheless, that is the target I will set. Six months ago, I started a training program with the intention of racing a marathon this September, aiming for a time under 4 hours. Initially, I followed a fairly typical polarised marathon program, including a small amount of tempo running (typically 5% of the weekly training duration), a weekly high intensity session, a substantial amount of easy running over distances of 8-10Km, and a weekly long run. Over the first few months I built up the long run distance to 34 Km. This weekly long run was not seriously stressful but nonetheless, left appreciable residual tiredness for a day or two. I was making steady progress towards my goal of being fit enough to race a marathon this September until June when I was laid low by a severe upper respiratory tract infection that left me suffering from pronounced ‘post-viral fatigue’. Just as I was beginning to recover from the post-viral fatigue, I suffered a freak injury. I was playing rounders with my research team in the evening after a fairly intense day of project planning. At one point, I dived full length to catch the ball and tore my right gluteus maximus quite badly. That was five weeks ago, and even now as I sit typing I can feel a diffuse ache in my right glute. It is clear that there is no prospect of being fit enough for a September marathon, so as I have started to rebuild in the past few weeks, it was an opportune time to carefully re-evaluate the question of how to go about achieving my goal for age 70. In my recent posts examining the training of seven elite masters athletes, it emerged that two of them, Ed Whitlock and Eric Ӧstbye, maintained their position at the pinnacle of international competition for longer than the others. Both followed a markedly polarized program. Whitlock in particular currently holds single age records for 11 of the 15 years from age 68 to age 82, and shows little sign of abandoning the quest for yet more records despite his decline in pace since age 80. (Though, unfortunately, in the past two months, his training has been limited by an unexplained ache in his upper thigh.) As discussed in my recent posts, it is almost certain that a natural predisposition to longevity has played a major role in his performances, but several features suggest that the nature of his training has played a crucial role in his long reign at the top of the world rankings. Most striking, the increase in frequency of 3 hour runs in his early 70’s arrested the ‘stutter’ he had experienced at age 70 and laid the foundation for his phenomenal 2:54:49 marathon at 73. Therefore my goal is to see if I can mimic the key features of his schedule – despite the challenge of fitting lots of long slow running around the edges of my working life. I am now 68. At that age Ed’s long runs were mainly of 2 hours duration. Therefore, over the next few months, I will aim to build up gradually to a level where I can do 4 two hour runs per week without evidence of cumulative stress. With regard to pace and running style, Ed does not measure his pace but runs at a slow shuffle designed to minimise stress on his legs. Ed’s self-depreciating word ‘shuffle’ implies minimal air-borne time. This photo of him running in the Evergreen Cemetery depicts a step length of about 60cm. The heel of his leading foot about to strike the ground before his trailing foot becomes airborne, in marked contrast to his fluent, powerful stride while racing. During my long runs, I too will adopt a slow pace with short-stride and fairly high cadence, in order to minimise impact forces, though I will not invoke the mental image of a ‘shuffle’. Instead I will aim for a sensation of relaxed fluency even at slow paces. I do not want to develop a habitual gait too different from marathon racing gait. Above all, I will avoid any sense of strain. As discussed in my previous posts, I consider that the small proportion of faster running during training and short distance races played an important part in Ed’s success. He, like the other elite masters marathoners discussed in my recent posts, maintained his speed over 1500m. I plan to do a weekly session of more intense training. However, at present I find that racing even short distances at peak effort produces lingering tiredness and musculo-skeletal aching. Therefore, during the initial stages, I will do high intensity intervals on the elliptical cross trainer, to provide a strong stimulus to both cardiovascular system and leg muscles without the damaging effects of eccentric muscle contraction. I will gradually replace these sessions by short hill sessions, with the aim of developing leg muscle power, and, will eventually include fairly regular short races. Where should I start? Before my training in June and July had been limited by post viral fatigue, and subsequently, in the first few weeks of August, by my torn Gluteus maximus, I had established a fairly solid base. In particular during my long runs of up to 34 Km I had run for periods of over three hours, albeit with appreciable accumulating tiredness. Avoiding the accumulation of tiredness is a key feature of my strategy, but I anticipated that running for an hour or so would be comfortable. So three weeks ago, when Gluteus maximus had settled sufficiently to allow me to re-start, I aimed for four runs of 65 minutes each together with one interval session of the elliptical in the first week. In fact I did five runs of 65 minutes quite comfortably, so increased the target time to 75 minutes for the following week. Again I appeared to be coping comfortably, and did six 75 minutes runs together with an elliptical interval session. I started the third week with a high intensity elliptical session, but found it noticeably harder than in previous weeks and my peak heart rate was higher. The next day was a busy day at work, but I nonetheless set off for a short easy run to enjoy the final glimmer of daylight on a balmy autumn evening. However my heart rate while running was noticeably elevated. The next morning, after a good night’s sleep, I did the elliptical sub-maximal test that I have developed to assess my level of stress. Resting heart rate variability (HRV) was lower than usual, and heart rate at all phases of the test was high, so clearly I had signs of accumulated stress, and could not dismiss the high heart rate when running the previous evening as a transient response to my busy day at work. A rest day was called for. On the remaining four days of the week I ran very easily for 80 minutes and heart rate remained re-assuringly low. Next week, I will again increase the duration of the easy runs. Progress is pleasing, but I need to continue to bear in mind that the immediate goal is building up the duration at a rate that allows me to do at least four long duration easy runs each week without evidence of cumulative stress. Ed Whitlock took five years to build up from frequent 2 hour runs to frequent 3 hour runs, so I am prepared to be patient. Nonetheless I hope to be managing at least four 2 hour runs per week without cumulative fatigue before Christmas. This entry was posted on September 9, 2014 at 9:19 pm and is filed under Training. You can follow any responses to this entry through the RSS 2.0 feed. You can leave a response, or trackback from your own site. I just watched read Canute’s amazing post and watched Stephen Seiler’s presentation (included in the post)– and this has me rethinking some of my basic training ideas. Be sure to check it out as this may affect how you should train for the rest of your life. One thing that jumped out at me when looking at Ed Whitlock’s race photo is how great his hip extension seems to be for an older fellow– his back leg definitely seems to sweep back while his back stays fairly neutral. I wonder if that’s one of his secrets? Most older runners I seem definitely don’t have his range of motion. I’ve recently started Kinetic Revolution’s free 30-day challenge, which is targeting my overly tight hip flexors and seems particularly useful immediately before (and sometimes during) a run. Maybe that could help you nail your marathon goals? Thanks for your comment, and for re-blogging my post. I agree that Ed has an impressive hip extension. Even when he is shuffling his trailing foot is noticeably far behind his torso, but his torso is inclined forwards, and the hip extension is not as impressive as when he is racing. I too am impressed by James Dunne’s 30 day challenge. At this stage I am ambivalent about the plyometrics in the later stages of that program, but I have been doing the stretches he advocates in the early part of his program. Achieving a good stretch of the hip flexors in difficult and I think James’ approach is good. It’s great to see you writing about progress in your own training. I’ve made quite a bit of progress in the last year with my ability to handle greater weekly mileage. I think a key part of this is that rather than focus on a 3hr long run at the weekends I did several 2 to 2 1/2hr runs in the week, with 1hr runs in between. Doing more long runs of more modest length seems to lead to move even stress on my body through the week allowing me to guage the ebb and flow of stress, repair and recovery better. I believe developing my ability to burn fats and running these longer runs at pace that doesn’t burn lots of glycogen has helped reduce the stress significantly. I have now got to the point that a hilly 2hr+ run doesn’t lead to much residual stress the next day, though I’m not quite resiliant enough to do them back to back every day of the week. I do wonder if it might be possible to rate training sessions by the amount of glycogen burned, and whether this metric might be a good proxy for stress level. The exact equivlance would in glycogen usage would depend upon the intensity, time and the how much glycogen the runner burns for a given intensity. I have done the maths yet, but in principle would expect relationships like a half hour section at tempo pace could burn just as much glycogen as an hour and half easy run. When I get a chance I’ll put together a spreadsheet to have a look at how different times and intensity of relate to glycogen usage and then put up a blog post on it. On a different note, I am convinced that anyone but elites run that close to lactate threshold in half marathon and longer races. An elite can run a half marathon in 70 minutes or less, while the average half marathon runner would struggle do it in 120 minutes. While the distances might be the same duration difference suggests that the different runners will have to be relying upon different levels of intensity relative to lactate threshold. Personally I would have thought that sustaining running near lactate threashold is something that is far more related to how long run at that intensity rather than how far your can intensity. i.e. it’s more likely that both an elite runner can run average runner can run at lactate threshold for an hour in time, rather than both being able to run at lactate threshold for a fixed distance. For a 4hr marathoner I would expect them to have to work at well below lactate threshold as it’s four times longer than they could maintain running at lactate threshold. Given this I would have thought the the training profile that is best for a 4hr marathoner should probably best be something closer to what an elite ultra-marathoner would under-take. The shift of training that would be appropriate would be more focus on aerobic running and fat burning capacity rather than running at around lactate threshold. Thanks for your comment. I agree that it is duration rather than distance that sets the limit on how near the pace can be to LT pace. Daniels’ formula (from which VDOT is derived) assumes that the ratio of the VO2 to VO2max is determined by the duration rather than the distance. Daniels predicts that an elite running a marathon in 2:10:00 must maintain VO2 of 65.1 ml/min/Kg . Daniels formula also predicts that the maximum value of VO2/VO2max than can be maintains for 130 minutes is 83.6%. Hence the athlete requires VO2max= 77.9. To achieve my target of 3:45:00, I will need to maintain VO2 of 33 ml/min/Kg. Daniels predicts the maximum value of VO2/VO2max that can be maintained for 225 minutes is 81%. To achieve my target, Daniels predicts I need VO2max of 40.8. In 2012 (at age 66) my HM time corresponded to a VDOT of 44. I have definitely deteriorated since then, but I think a VO2max value of 40.8 at age 70 is feasible if I can arrest the decline. Thus, according to the Daniel’s formula, to achieve 3:45:00 I will need to maintain VO2/VO2max = 81% whereas an elite running a marathon in 2:10:00 would need to maintain VO2/VO2max = 83.6% I will not be quite as close to LT as an elite might be, but in fact, only a few percent lower. With regard to the training required, the evidence presented by Stephen Seiler suggests that contrary to expectation, one does not need to do a lot of threshold training to achieve elite performance in endurance events, despite the fact that race pace is near to LT. The evidence suggests it is preferable to do polarised training that entails a large proportion of easy running and a small proportion of high intensity. The easy running is the central feature of ultra training. The principle difference for the marathon is the inclusion of a small amount of high intensity and a small amount of threshold work. That is what I propose. I think Daniels formulas like the McMillian Running Calculator suffer from the same flaw that the models are based on performances of elite athletes that are able to maintain their pace over longer distances better than average runners. When I first started running I found my 10k times suggested a 3:10 to 3:15 marathon should be possible but until this year they were all in the 3:33 to 3:54 range, I just wasn’t able to convert the base speed to the longer distances like the models suggested. Over the last two years I beleive I have closed the gap, with only modest improvements to my 10k time but huge improvements to my ultra distance performances. I haven’t done a road marathon as a full on race to know just how well I’d do now, I expect I’ll be much closer to the Daniels/McMillian estimates than before. I believe my basic aerobic fitness and in particular my fat burning capacity has improved dramatically to close the gap, improvements in my structrual resilience will also have played a part. Eating a better diet and doing lots of easy miles consistently seems to part to how I’ve improved, as well as just having more years running in my legs. I mention this as if you haven’t been able to train consistently and your aerobic fitness, fat burning and structural resilience haven’t been sufficient built up the Daniels and McMillan estimates will be way off. For most casual runners I believe they’ll not come close and be disappointed like I was a few years back. For yourself, the only way to know how closely you track the models like Daniels is to go an race over a range of distances and see how you compare. Such an comparison might also inform you of where you are weakest. I do not have records of the exact times I recorded as a youth, but the approximate details I remember would have given me a higher VDOT for marathon (about 69) than for 1500m (about 60). I did not do specific middle distance training and was better prepared for longer distances – perhaps largely due to jogging to and from school as a child and then doing a lot of hill walking and mountaineering as a young adult. Thanks Canute – I was wondering how you were going to adapt the training of Whitlock to your own situation. I think keeping an eye on accumulating stress (as you are doing) will be key. Whitlock wouldn’t have been working a demanding job (I presume!) so the stress and tirednes you have to manage will be greater. The two photos of Ed (doing ‘shuffling’ long runs and racing) are a great demonstration of polarised training. A picture is worth 1000 words! The ability to switch between two markedly different running forms would become automatic after so much practice of regularly switching (with his regular fast racing). Perhaps even a set of strides and drills could be useful on a day that you didn’t feel like a harder high intensity session? Are you scheduling in any ‘down weeks’ of much reduced mileage? I’m thinking of the mental aspect of your plan rather than the physical. All the best and looking forward to regular updates of your progress. Thanks for your comment. I agree that avoiding cumulative stress is the crucial issue. The evidence from the elite masters marathoners, and especially from Ed Whitlock, appears to point towards minimization of accumulated stress as the key to longevity. That requires sensitivity to one’s own state and preparedness to adjust the training load as required. I will utilize HR and HRV to confirm perceived tiredness. I have not scheduled regular low volume recovery weeks at this stage, but will be prepared to drop the volume for a week if I find that one or two days rest is not enough to deal with any accumulating stress. Stumbled across this fascinating analysis of runners especially over the age of 40 and is very interesting to me as I feel that at endurance events ie 42.2km and of course our countrys prime race the Comrades Marathon I still forsee better times for myself.Another great older athlete that hasn’t been mentioned here is Martin Rees from Wales and his amazing achievements.In the ultra events it seems to favour the older athlete especially in the Comrades where the average athlete is 40 years old.I have also found that a lot of running that is duration based and on difficult terrain not concerning pace helps.The part that amazes me is where do they find the time,I must assume most don’t have young children to contend with and therefore have time in the mornings and afternoons as recovery is critical.Vladimir Kotov who runs 200km per week and ran a 5hr48min Comrades at age 50 says he sleeps 14hours a day so his social life must some how be nicely organised.Intensity though must not be neglected and that’s the hard one to manage but the genetic factor is the one that is so difficult to debate and I assume it plays a huge role in most of the exceptional older men and women who excel at running. Thanks for your comment. Martin Rees is certainly one of the most impressive veteran distance runners in the UK at the moment. His 71 min HM last year at age 60 is simply amazing. Even when he was doing long hours (including night shifts) in his job as a steel worker, he trained pretty hard. He retired last year so it will be very interesting to see what he can achieve now he has more time to train. I understand that he usually does 2 very demanding speed session per week. Even his easy paces are fairly fast, though he does take time off to recover when he is tired. He also does quite a lot of walking and cycling. I think that this year he is focussing mainly on the shorter distances. As far as I know he has not run a marathon since his mid-forties, but it will be really interesting to see what he can achieve if he tries the marathon again. no massive 20 plus long runs. Hoping for a 3:40 in Jan. I can not do all the marathon pace running they suggest but do what I can without absolutely knackering myself. Thanks for your comment. I agree with the Hansons’ emphasis on back-to-back moderately long runs rather than a focus on a single longer run each week. I do not think there is much evidence in favour of lots of ‘massive 20 miles plus’ long runs. Although Ed Whitlock does not measure distance, even his three hour slow runs are probably no more than 20 miles and possibly less. The photo of him running in the Evergreen Cemetery indicates a step length to 60 cm. At cadence 200 steps per minute that would amount to only about 21.6 Km (13.5 miles) in 3 hours though I suspect that his step length is usually a bit greater than 60 cm. When preparing for the Toronto marathon at age 73, Ed did about 15 hours of running per week. As far as I can gather his average training pace was no greater than 9 min miles, which corresponds to 100 miles in 15 hours, but the picture of him training raises the possibility that his pace might often have been slower than 9 minutes/mile. So I think that Ed’s example suggests for a 70 year old, there is little reason to aim for 100 miles a week and even less reason to aim for runs longer than 20 miles. I think a small amount of MP pace is good but a substantial amount is damaging. I am building up slowly and will be happy if I am running 60 miles plus some elliptical sessions each week by the end of this year. Good luck with your attempt to do 3:40 in January. I enjoy these posts. I’m barely a master (40 years old) and find Ed’s approach very interesting. I have dabbled with it myself and found the hardest thing is running easy enough (to the point where I’m barely passing people out walking) and also dealing with the time required for 90+ minute runs everyday. Thanks for your comment. It is almost certain that one of the factors in Ed phenomenal training and racing is the fact that he commenced serious marathon training after retiring from work. For those of us still working, his schedule would be virtually impossible. While he himself avoids claiming that his training has lessons for others, I do think that he provides an interesting illustration of the fact that low intensity training and intense racing can work together well. One crucial ingredient is avoiding excess stress. Perhaps the real ‘junk miles’ are the miles that generate excessive stress. I continued to use the adapted Hanson plan and last year age 69 got my Marathon time down to 3:37. This year which was to have been my last Marathon I was putting in a special effort to do as much of the marathon pace running as I could. Unfortunately my highest mileage week coincided with the stadium being occupied for the week by Schools athletics so had to do the training on the road. Injury to hamstring. No marathon this year but 2017 here I come. Well done with the 3:37 at age 69 and good luck for next year. The Hanson plan clearly works. It places some emphasis on tempo runs which are undoubtedly an effective way to improve fitness, though I think that in general they produce a slightly lower ratio of benefit to stress than interval sessions. Although the Hanson plan is quite different from the Whitlock approach, in fact it has a similar emphasis on avoiding undue stress. In at least one important respect they are quite similar: both avoid demanding long runs. Whitlock avoids demanding long runs by doing his long runs at a glacial pace, and in any case even Ed’s 3 hour runs are probably not extremely long, because they are so slow. The Hanson plan simply does not include very long runs. However, in both approaches the longish runs are done on at least moderately tired legs: in Ed case, because he does at least three longish runs per week, while in the Hanson plan the longish run follows a tempo run. Overall, despite the emphasis on three quality sessions each week, the Hanson plan is designed to be challenging while avoiding undue stress. you will find always no debris being offered for loyal players.